In a skillet over medium high heat, add the oil. When hot and shimmering, add the garlic and onions. Saute until softened. Add the ground beef/pork to the skillet, crumbling in. Cook until browned. Add the potato and water, cooking until potato is softened. Add salt and pepper to taste. Remove from heat, drain excess liquid and set aside to cool completely. In a separate bowl, mix together the 3 cups of flour and salt. Cut the butter into the flour mixture with a pastry blender or two butter knives. Make a well in the center of the flour mixture and pour the ice water into the center. Mix the wet and dry ingredients with a fork until it becomes stiff. Turn the dough out onto a lightly floured surface. Knead it just until all the flour is incorporated and the dough is smooth. Wrap the dough in plastic and set aside for at least 30 minutes. Remove the plastic from the dough and divide the dough into 20 pieces. Roll each piece of dough into a small ball in the palm of your hands and flatten the dough out to a round flat piece. To fill your dough, place 1 tablespoon of cooled filling in the center of each dough circle, leaving 1/2 inch border around the edges. Top the filling with a slice of hard boiled egg. Brush the edge of dough with eggwash, fold over the filling, and crimp the edges to seal. 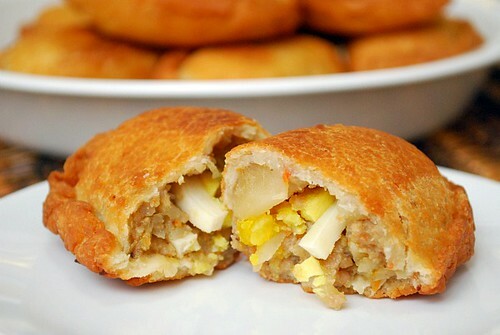 Fry the filled empanadas in oil until golden brown and serve hot. Yummy yum, Joelen! 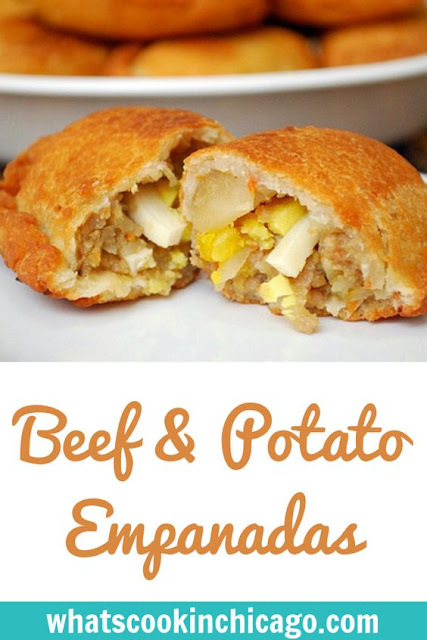 :) I love empanadas and this is sure to be a winner. Thanks for hosting the virtual shower for Krystal! 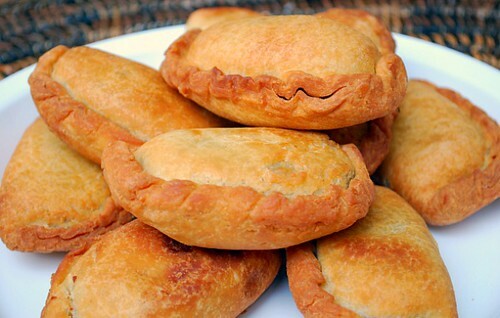 Mmmm, empanadas! Totally drooling over here!